On pages 886 and following, a typed report can be observed, which was elaborated by the holidaying group after a detailed joint meeting, that recalls that steps that were made on that evening, describing the facts both in time and space. Il s'agit de la 3è time-line élaborée et signée par le groupe, remise d'abord au consulat. On pages 983-984, the preservation, for visualization purposes, of images from several petrol stations was requested, but nothing out of the ordinary was observed, page 3191. On page 1592, a divulgation, appealing to the person who on the 3rd of May 2007, at around 9.30 p.m., in Praia da Luz, transported a child in his arms, to identify himself, in order to dismiss the situation that was narrated by witness JANE TANNER. Ce porteur d'enfant a été par la suite et par les forumeurs surnommé Tannerman. Mais l'heure n'est pas exacte, JT dit avoir vu Tannerman vers 21h15. Further on this issue, the testimony of MARTIN SMITH was considered, pages 1606 and following, reporting the sighting of an individual carrying a child, in one of the streets that lead to the beach. It was said that the child could be MADELEINE McCANN, although it was never peremptorily stated. Some time later, the witness alleged that, by its stance, the individual who carried the child could be GERALD McCANN, which was concluded when he saw him descending the stairs from an airplane, pages 2871, 3991 and following (Mémorandum ici et voir là) and 4135 and following. It was established that at the time that was being mentioned, GERALD McCANN was sitting at the table, in the Tapas Restaurant. Ce porteur d'enfant-là a été surnommé Smithman. Remarquer qu'il n'a pas été établi qu'à l'heure où la famille de Martin S a croisé Smithman (quelques minutes après 22h, la famille S ayant, selon Aoife S, quitté le Kelly's Bar à 22h), Gerald MC se trouvait au restaurant. Aucun employé de table n'a déclaré qu'il s'y trouvait. Aucun non plus n'a déclaré qu'il ne s'y trouvait pas. Indirectement deux membres du groupe ont admis qu'il était là (puisque Kate s'est adressée à lui en lançant l'alarme). The workers that carried out construction works in Vila da Luz were heard, pages 1650 -1651, who did not detect anything strange, during their works of excavation and placement of plumbing (also see pages 3983 to 3987), although they carefully verified, on the day that followed the disappearance and before they started the works, if there was a body hidden next to said works. 1 - Apartment 5A, of the resort 'Ocean Club', place from where the child disappeared. On the locations and the pieces that were marked and signaled by the blood dog, forensics tests were performed, especially at a reputed British laboratory (Forensic Science Service – check Appendixes I and VII – FSS Final Report) but also, some of them at the reputed National Institute of Forensics Medicine (check Appendix I), whose final results did not corroborate the canine markings, which is to say, cellular material was collected that was not identified as pertaining to anyone specific, and it was not even possible to determine the quality of that material (v.g. whether it could be blood or another type of bodily fluid). Based on the action of the canine team and the aforementioned initial scientific approach, which revealed the possibility of the existence of a cadaver inside the apartment and in the vehicle that was used by the MCCANN family, and in order to allow for GERALD McCANN and KATE HEALY to see their position within the process safeguarded, they were made arguidos, in face of the mere possibility of their involvement with the possible cadaver. During the questioning as arguidos, they denied any responsibility in the disappearance of their daughter. It may be questioned that KATE HEALY was not immediately made an arguida, but rather inquired, as a witness, and only afterwards, following said inquirition, did she assume that quality. Therefore, the constitution of KATE HEALY as an arguida was made when she was confronted with concrete elements that might lead to her incrimination, a fact that, within the terms of the penal process law, would officiously force that constitution. Nonetheless, before her interview, the photographs were examined, as related on pages 4155 and following, and pages 4197, in which it is alleged to not be possible to determine with complete confidence if the printer is compatible with the photographs, but it seems to us, by the laboratory results (merely indicative) that these photographs were printed there. On pages 2305, 3195, 3212 is the detailed report, relative to the laboratory exams done on the apartment from where the disappearance occurred, which took place on 4 May 2007. On pages 2360 to 2371, is the report of the vehicles belonging to LUÌS ANTÒNIO, with whom, also, ROBERT MURAT had an acquaintance. Nothing suspicious was found. PF n'avait aucun moyen de savoir si l'enfant qui pleurait était MMC évidemment. Ce qu'elle a déclaré, c'est que ce n'était pas un petit enfant, ce qui excluait les jumeaux. Elle a dit aussi que l'enfant appelait "Daddy". She also added to the files, that her niece, CAROLE, on the morning of 3 May 2007, had seen an individual observing the child’s apartment. This individual was not identified, but could have been a gardener. An interview with CAROLE was requested in the Letter Rogatory submitted to the UK authorities, with nothing relevant having been discovered. A new occurrence was explored on pages 2876 and following, concerning a crematorium, where according to the press, the cadaver of the British minor could have been placed. The crematorium was closed and sealed, according to what is explained in the aforementioned report. On page 2962, the holiday group’s flight data is added, in its entirety. Non ! On pages 3148 and following, the sighting of an individual with a strange behaviour, though not substantially founded, who sometimes was motionless and other times spoke on the phone from a cabin, is mentioned. That individual, according to witness statements from pages 3150 to 3156, had some similarities with the figure that was described by JANE TANNER, page 3157. Nothing was established that could relate him to the facts. Le rapport devrait indiquer que 1) les RSU étaient collectés tous les soirs entre minuit et 4h, sauf le dimanche, 2) personne n'arrêta le camion la nuit de la disparition , et 3) les poubelles furent inspectées (aucun détail de la manière de procéder dans les PJFiles) le 7 mai, soit après avoir été vidées trois fois. 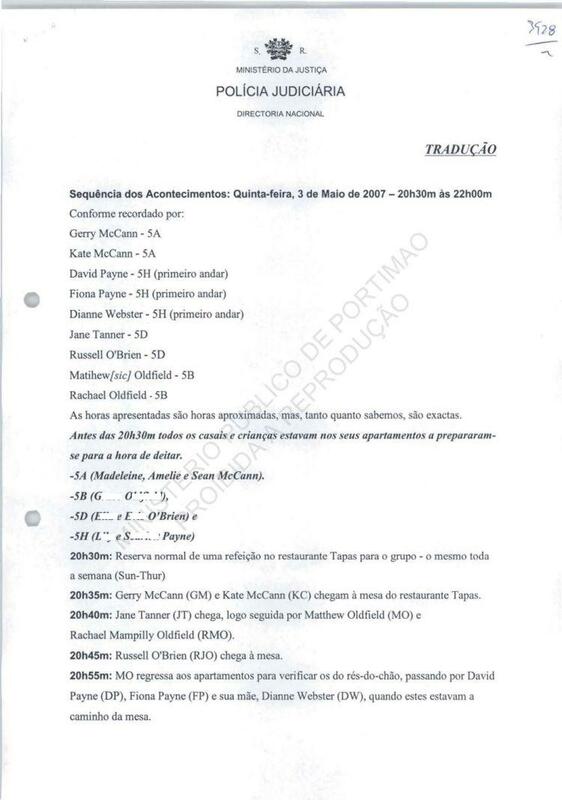 According to what is documented in the process, on the afternoon of the 3rd of May, the group, with the exception of the McCANN family, were in a bar next to the beach, named "Paraíso", and the images from the video surveillance system were appended, pages 3266 to 3273, which did not supply any further clarifying elements. Ces pages concernent des objets prélevés chez Robert M pour analyse. Pour les TP7, indication de banque et cartes de crédit, mais pour les MC, pas de compte courant, pas de carte de crédit. Il ne semble vraiment pas que ce curé, qui ne parlait pas anglais, ait eu une relation étroite avec les MC. En revanche la famille du révérend canadien anglican Hubbard, arrivée à PDL trois jours après la disparition, eut une relation forte avec les MC. Il s'agit de la ligne de temps traduite en portugais élaborée et signée par les TP9. Il s'agit du patron d'un bar qu'une amie des parents de Kate MC avait alerté, l'impression étant que la police ne se démenait pas. On page 3418-a YVONE MARTIN was questioned, who offered some information, which, despite its pertinence, did not show any relevance, pages 3421-a and following. Le rapport ne dit pas que YM envoya une lettre anonyme à la limite de la délation concernant David P.
Information was collected from a Spanish detective agency, named "Método 3", which was hired by a British citizen, to benefit the McCANN couple. This contact was solicitated by this agency, and the information that was given was subject to analysis and dismissal by this Police, pages 3434-a and following. It revealed itself, all of it, as speculative and without fundament, focusing particular attention on ROBERT MURAT. Le millionnaire du double vitrage, Brian Kennedy, découvrit cette agence et offrit de payer l'excédent, Madeleine's Fund payant les frais fixes. From the tests and inspections that were carried out, a biological residue was collected which supposedly carried identificative value. Faced with this, the same residue was sent to Interpol, in order to be compared with the compatible databases, page 3467-a. From this moment on, it became necessary to request from the British authorities the performance of a set of diligences, that had the purpose of helping to clarify the facts and to establish what type of crime had been committed, as well as the responsibility of the corresponding authorship, pages 3528-a and following. Jusqu'à 3576. C'est sur ce long document qui établit les questions à poser aux témoins sélectionnés, daté du 5 décembre 2007 et signé par l'inspecteur Joao Carlos, que s'appuiera le Ministère public pour rédiger la Lettre rogatoire. 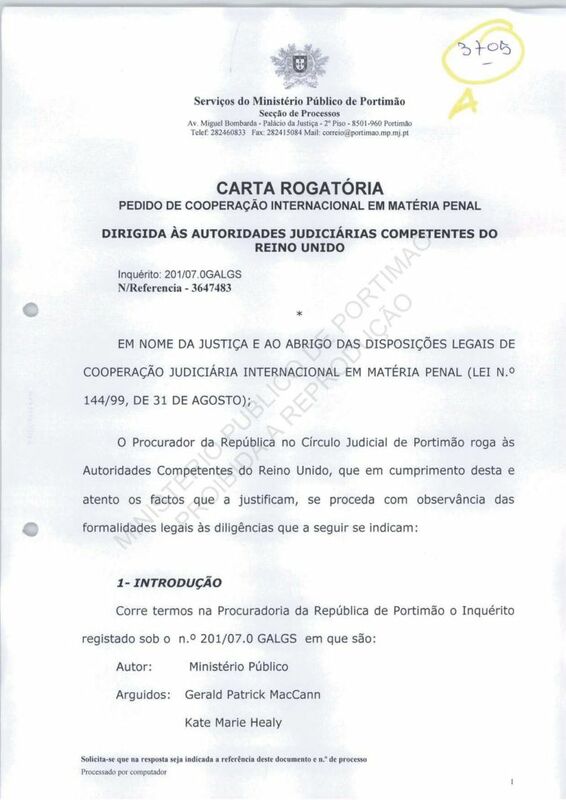 Therefore, from page 3705-a to 3792-a the Rogatory Letter (in Portuguese) is appended, that was elaborated by the Public Ministry and dated 19.12.2007, based on what had been reported by the Polícia Judiciária, and from page 3795-a to 3822-a, a second rogatory letter, this time elaborated at the solicitation of arguidos GERALD McCANN and KATE HEALY. Graham MK, celui qui a entendu Gerald MC parler de gang de pédophiles au téléphone, la nuit du 3 mai. From pages 3932 to 3937, another witness alleged that she had seen GERALD McCANN, in Avenida Descobrimentos, in Lagos, near an ATM terminal, at around 2.26 p.m. on the 7th of May 2007. According to the witness, the father of the minor was talking on the phone, saying "don’t hurt Madeleine, please". She was not peremptory in affirming that it was GERALD McCANN. It seems unlikely to us that it was GERALD, given the fact that on that day, he only activated antennas in Praia da Luz, adding to the fact that, at around 2.16 p.m., he activated an antenna in the centre of Praia da Luz, which we consider to make it impossible that he was present in Lagos ten minutes later. On pages 3943 and forward, is the request for a comparison of the DNA for MADELEINE McCANN, with the genetic profile of a child's cadaver found on the coast of the USA, victim of a homicide. It was verified that they were incompatible. Now in an advanced phase of the investigation, pages 3965 to 4113, there arises, related to the private investigation developed by the McCann couple, and publicly announced by their spokesman, CLARENCE MITCHELL, the alleged existence of a suspect, which, supposedly, was undertaking a collection in Praia da Luz, at the time of the disappearance. A fotofit was created of this individual by a witness – GAIL COOPER – who saw him, page 3979. In order to assess the credibility of the description and of the drawing, it is important to highlight that the witness GAIL COOPER, was heard for the first time and in a very detailed fashion [emphasis in the report], by the British authorities (see page 3982), then affirming that she saw this person only one time [emphasis in the report], in a collection done at the door of the residence she was occupying during her holidays. However, a few months later, in a new deposition, the same witness affirms that she saw this individual three times [emphasis in the report] (one of which he was watching, in a strange way, the children at the Paraíso Restaurant), during her stay in Luz, information which she did not supply at the time of her first deposition to the police in the UK. With the publication of this portrait, a myriad notices about sightings of this individual arose, most from the UK, but also from Portugal (see page 4130). All of this information received due treatment and evaluation in regards to credibility, of which nothing has come until now, in spite of innumerable persons approached, supposedly of similar appearance with the "suspect". On page 4116, a situation that was related to an individual who had been referenced for sexual abuse of minors was explored, whose inquiry was under process in this Department. There was no information whatsoever concerning his involvement in the present investigation, yet, as it referred to a sexual crime against minors, several diligences were carried out, whose result, for this case, was fruitless. On pages 4163 to 4165, the situation that involved the abduction and murder of a minor of gipsy ethnicity, in the city of Huelva, Spain, was considered and duly correlated with the disappearance of MADELEINE McCANN. After several contacts were established with the investigation that was ongoing in the neighbouring country, it was concluded that the occurrences are disparate among themselves. From pages 4167 to 4182, the forensics report from the National Institute for Forensic Medicine was appended, whose conclusions do not allow for significant advances in the investigation, but which identify several different haplotypes, some of which match intervenients in the process and others without any identificative value. Equally, all the locations where images that could be related to the case might exist, were consulted (like, for example, restaurants and petrol stations) and telephone lines from the permanent services of the departments in Faro and Portimão were made available, and a mobile police post was installed in Vila da Luz for the collection of information. Also, regarding the missing child's parents, the PJ was careful to schedule periodic meetings with them and to designate an Official Liaison to the family as support for a permanent relationship, with the accompaniment and active collaboration of the Royal British Consulate in Portimão. The PJ, as in probably no other investigation in Portugal, withheld no effort, in the sense of providing exceptional technical means, manpower and financing towards the discovery of the child and the determination of the truth of the facts, having been completely accompanied in this effort by the Leicestershire Constabulary, the police department headquartered in the city of Leicestershire, from where most of the elements of the holiday group are from. Seuls les MC habitent le Leicestershire. As another example, just the scientific exams alone cost many tens of thousands of euros.
. The establishing of a timeline and of the effective checking of the minors that were left alone inside the apartments, given the fact that, believing that said checking was as tight as the witnesses and the arguidos describe it, it would be, to say the least, very difficult that the conditions were reunited for the introduction of an abductor in the residence and the posterior exit of said individual, with the child, namely through a window with little space. It is added that the supposed abductor could only pass that window holding the minor in a different position (vertical) from the one that was visualized by witness JANE TANNER (horizontal).
. What happened during the time lapse between 5.30 p.m. (the time at which MADELEINE was seen for the last time by a person that differs from her parents or siblings) and the time at which the disappearance is reported by KATE HEALY (at around 10 p.m.). Les auditions rogatoires n'ont rien donné. It results from everything that has been done, despite the efforts that were made and all investigation lines being explored, that it is not possible to obtain a solid and objective conclusion about what really happened that night, and about the present location of the missing minor. On the other hand, it should be referred that this investigation moved itself under conditions of exceptional media exposure, with the publication of many "news" of imprecise, inexact or even false contents, which did not help, in the least, the discovery of the truth and created, many times, a climate of unusual commotion and of lack of serenity.